The New Mobile SCUD chemical transfer pumps from TSI Beacon can measure and deliver small doses of chemicals for small hand held/backpack sprayers and motorbikes, as well as deliver larger amounts of chemical (liquid or granule) to helicopters and spray planes. 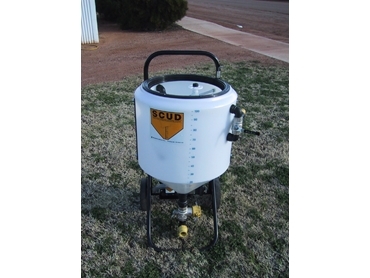 Ideally suited to be used in a wide range of applications such as spray planes, multi-machine spray contractors, forestry, horticulture and viticulture, the mobile SCUD chemical transfer pumps allow for one simple filling system for farmers with two or more boomsprays or for farmers with the one fill up point. The mobility and 100 litre tank size of these new chemical transfer pumps makes them the ideal chemical transfer system for Ag spray planes, because they can be wheeled forward from the fill up point for faster filling and release.